Leader of Iran’s Islamic Revolution Ayatollah Seyyed Ali Khamenei says the US and its liberal democracy have been discredited more than ever under the presidency of Donald Trump. Ayatollah Khamenei said on Saturday the US is now weaker and more disgraced than 40 years ago if we look at it from a broader point of view. According to the Leader, the US and its liberal democracy have lost the rest of their face under the incumbent president Trump. The US is currently on the decline, with a big number of respected US politicians believing the country’s soft power has been weakened in recent years, he said. “The current US is much weaker than 40 years ago. Their hard power, including the economic and military power, is also on the decline,” he said. “The US military is in chaos and that’s why they use organizations like Black Water to advance their military agenda. The US also has a $15 trillion dept and a $800 billion budget deficit,” he said. Ayatollah Khamenei said the trend was visible during Barack Obama’s presidency and has become increasingly clear during the tenure of his successor, Donald Trump. Ayatollah Khamenei said the US has in the past 40 years been defeated by the Islamic Republic, failing to achieve its objective of regaining the control it had during the rule of the despotic Shah regime in Iran. He said the US has spared no chance to take Iran back during the past four decades. “The challenge between Iran and the US has been going on for 40 years and the enemy [the US] has made various moves, from waging military and economic war to media war,” he said. The Leader said the US has made every effort to regain its control over Iran to no avail. “There is an important truth here and this is the fact that in this 40-year challenge, the US has been the loser and the Islamic Republic has been the winner,” he added. “The reason why the US has been defeated is that Washington has started the attack but it has failed to reach objectives,” he said. November 4 marks the seizure of US embassy in Tehran by Iranian students in 1979, less than a year after the victory of the Islamic Revolution that toppled the US-backed Pahlavi monarchy. Every year, the Iranian nation, particularly the students, hold rallies across the country to mark the day. In the capital city of Tehran, the rallies to mark the anniversary of the landmark day are held at the venue of the former US embassy. 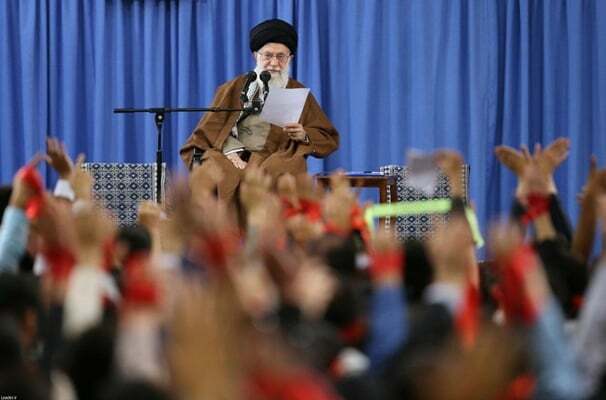 The Leader said another evidence demonstrating the US failure is the rise of pro-independence sentiments among the youth in Iran and other countries. “Our youths, even those who may not even be so religious, are sensitive about the foreigners’ control. This [pro-independence] sentiment gradually influenced youth in other countries, particularly our neighbouring countries,” he said. The Leader said these feelings are behind the increasing anti-US sentiments in the region. Ayatollah Khamenei said the US accuses Iran of orchestrating anti-US moves in the region, ignoring that fact that the anti-US sentiments fuel such moves. “Why Americans do not understand the nations’ hatred of themselves? You did mischief, sought hegemony and you deserve hatred,” he said. Contrary to the US, Ayatollah Khamanei said the Islamic Republic of Iran has in the past 40 years been constantly making progress. The Leader said the US imposed severe sanctions on Iran to stop the country from making progress, but such pressures have pushed Iran towards standing on its own feet and boost domestic production. “We witness a serious move towards political and industrial independence in the country,” he said. The Leader said Iran is determined to keep up resistance against the US and it won’t compromise with Washington. “Those [inside Iran] who are inclined towards compromise are devising useless plans,” he said. The speech was made on the eve of the return of US sanctions that had been suspended under the 2015 nuclear accord. Washington withdrew from the nuclear deal early May and since then it has been working to hamper Iran’s trade with Asia and Europe and cut down to zero global purchase of Iranian oil. However, after defiance by Iran’s oil clients, the US was forced to give waivers to eight of them including Japan, South Korea, China, India, Iraq, and Turkey.